So I compiled a list of homes in areas that list & sell above $1,000,000. Based on properties that have already closed during the past year, the answer would be The Ridges which is a very exclusive Golf Course community located in Summerlin. The Ridges has dominated the market with 8 of the most expensive homes sold in the past year out of the top 20. Closed prices in The Ridges range from $1,500,000 to $7,000,000. The Ridges also dominates the market with the highest inventory of homes for sale above $1,000,000 with a total of 48 properties. They range in price from $1,450,000 up to $30,000,000. 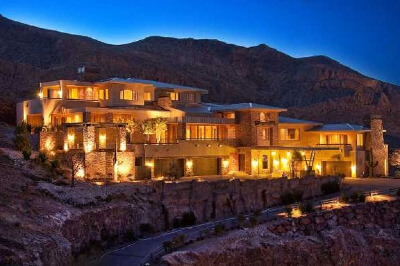 MacDonald Highlands includes Dragon Ridge which is located in the city of Henderson, Nevada is in Second place. With 26 sales in the past year between $1,050,000 and $4,190,000. Currently there are 27 homes listed between $1,092,000 & $15,000,000. Southern Highlands Country Club Which is located in Las Vegas, Nevada is in Third place in terms of the highest prices paid for a property. There are 17 homes that closed between $1,048,000 and $3,000,000 in the past year, there are 21 homes for sale between $1,050,000 and $9,500,000. Anthem Country Club in Henderson, Nevada has had 18 closing between $1,000,000 and $4,400,000 in the past year and has 12 homes for sale between $1,070,000 & $7,999,975. Seven Hills which is located in Henderson, Nevada and is located next to Anthem Country Club. There were 11 closings in the past year between $1,000,000 and $2,700,000. Currently there are 12 homes for sale that are listed above $1,000,000 with the most expensive listing being $6,250,000. In Summerlin there are several Golf Course communities including Tournament Hills, Canyon Fairways, Bellacre and Queensridge that have had sales between $1,000,000 and $3,800,000. There are also over 86 for sale in these areas between $1,000,000 and $6,995,000. Many of these communities have homes available below the $1,000,000 price range. Now is great time to own in one of these exclusive luxury communities before prices increase. Call me now to find out more about these spectacular communities or to make an appointment to preview them today! « One Queensridge Place Condominiums and why it may be the perfect high-rise for you.